Arrived Thursday and could hear elk bugles from camp. Haven’t got close to any, but I’ve seen about a half dozen bulls so far. Lots of hunters, but it’s big country. Came to town this afternoon to make calls and pick up a few items. I’m preparing to depart on an Idaho archery elk hunt and a Nevada muzzleloader mule deer hunt at the same time. I’ll be hunting with my brother, Rob and cousin, Wes. The Idaho hunt will be a week followed by a week in Nevada, where I’ll be joined by Jerry Lowery. Loading for two hunts isn’t a big deal, but the archery and muzzleloader gear adds a little to the detail work and requires a little more practice. I haven’t been shooting the bow as much as I normally would. The latest addition to my muzzleloader hunt is a new rifle. I gave up on the Remington muzzleloader and purchased a T/C Triumph. The Triumph, sometimes known as the Michael Waddell Bonecollector model, is a superior muzzleloader. It’s easier to clean, lighter, more reliable and more accurate. The biggest factor in accuracy is the fiber optic site. The fiber optics allow me to hit targets out to 100 yards just like the good old days when I could see. I am optimistic that I’ll be able to bring home a nice buck. So the plan is 7 days of elk hunting and 7 days of mule deer hunting. We’ll be in Southeast Idaho, near the Wyoming border for elk. Plus I have a general season deer tag in Idaho as well. But, we don’t normally see many bucks while elk hunting. The Nevada hunt will take place near Eureka. I’m planning to make a couple posts while on the trip. These locations are somewhat remote, but there will be opportunities along the way. In some cases cattle grazing can be controversial – not on our ranch. We believe that cattle grazing is a necessary component of good land management, especially when managing for native species. Native habitat did not include thick stands of imported European annual grass. Native grasses tended to be perennial bunch grass with space in between the clumps. Space which accommodated the critters and also various other plants which the native species fed upon. On a recent hike, I took two photographs of areas that were grazed and on the same hillside only about 200 yards apart (not on our property). They were in the same field and the same grazing practice was taking place at each photo site. The difference is dramatic. In both cases, the habitat was not ideal. 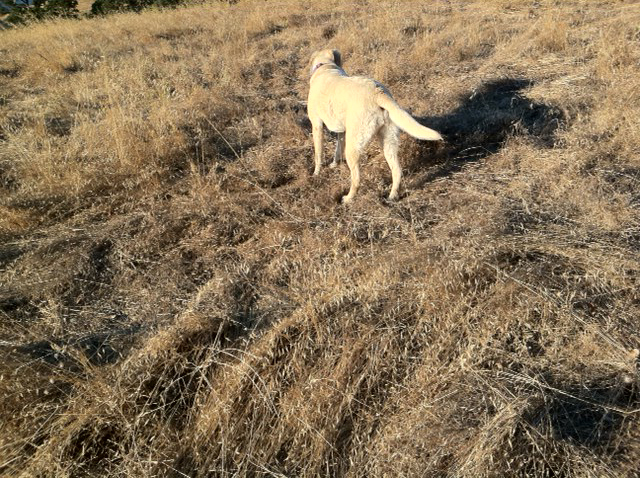 In the first photo, the grass was thick and matted down. At this location the cattle had completely ignored the grass. This thick stand was not useful for anything. I had a hard time understanding how the grass could be so completely ignored. At the second site, the opposite was true. This second photo is tough to fully appreciate, but the grass is nearly gone and the result is star thistle taking root. 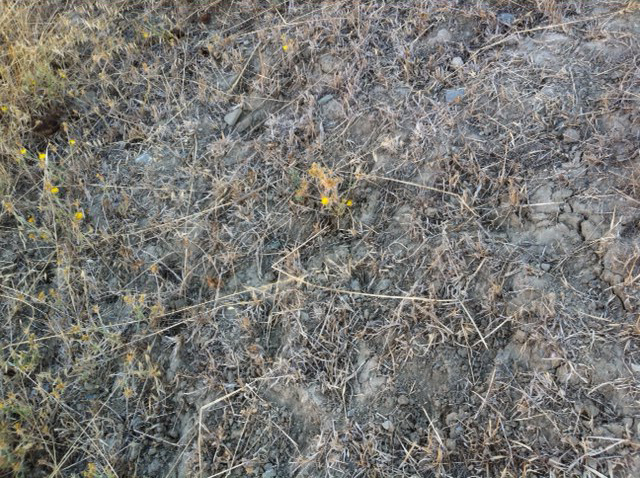 At this overgrazed site, the grass had been nearly completely grazed and non-native star thistle, an invasive and undesirable plant is moving in. Why did the cattle prefer this site to the other? I don’t know. Part of it may have been access, as the second site was very close to a road, which made it easy to reach. These photos demonstrate why it is difficult to manage grassland with cattle grazing – it’s a dynamic situation. 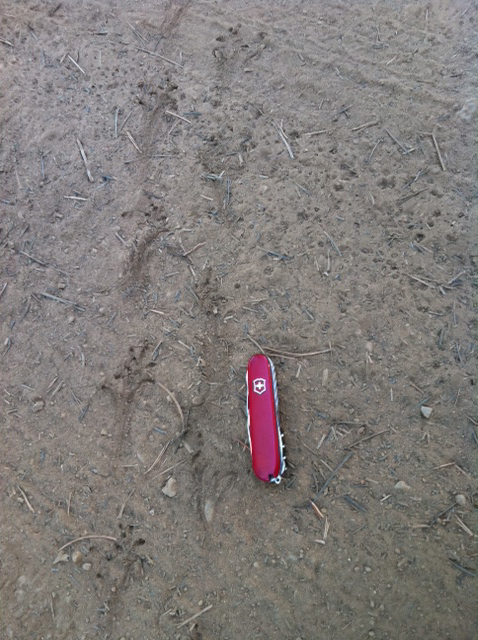 While on a fishing expedition to McCoy Flat Reservoir near Susanville, I found this set of tracks in a dusty road. 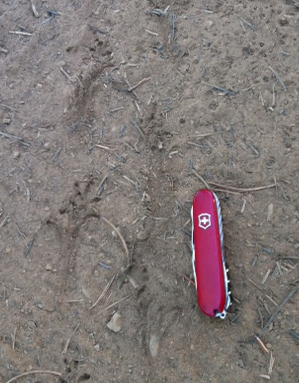 I pondered these tracks for a while and then took a photo so I could do some research. If you figure them out on your own, I’m impressed. After some research, I came up with the answer. You can tell the critter has long claws. Answer: Pocket gopher. For more info click on the link below.